This is another one of those chidhood dishes that we reminisce about. See, here below is the recipe that our yaya typed up for me. This is from 18 years ago. 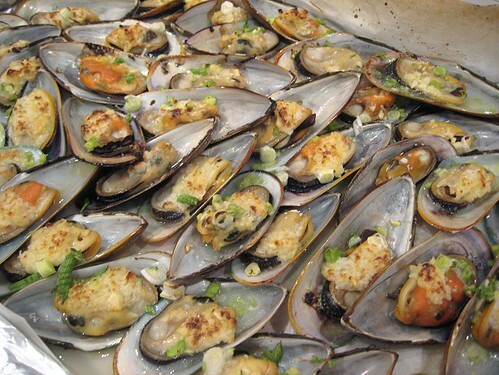 Baked tahong are half-shells of mussels topped with garlic, butter and cheese. Then, of course, baked. 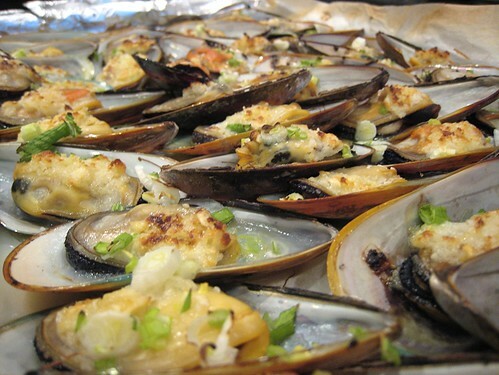 We didn't have an oven in the Philippines before, so this dish was made using the toaster oven. We haven't made this dish ourselves EVER. That is, I've never had occasion to use Yaya's recipe above. I think it's the opening of the mussels that deterred us. As JS mentioned, we do tend to suffer from lack of industry. It's a chronic condition. 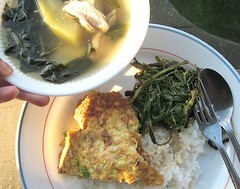 I confess, we didn't cook this the same day as the chicken tinola, oyster torta and adobo kangkong. But, we planned to. It was just that the frozen mussels we bought didn't thaw completely. 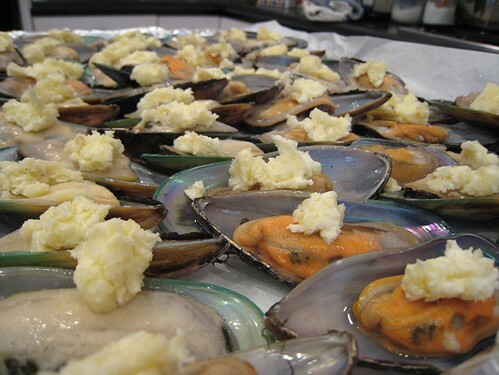 Why frozen mussels, you ask with disdain? Because! They're green shell mussels! These green shells are nice and iridescent, with a gradation of colors from green to silver to orange. A little stupid that I didn't think to take a picture of the GREEN SHELL nature of these mussels. Another bonus and a solution to our lack of industry problem, they came already on half-shells! 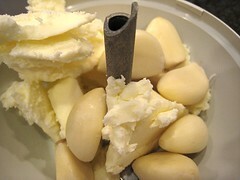 I whizzed together some garlic cloves and butter. Then onto the mussels they went. Into the oven until the topping melted and browned a little. Some chopped green onions served as garnish. Ah yes, as you can see from above, we omitted the cheese. We didn't have any kind of cheese in the house and JS also said she didn't want any cheese. This was so good. 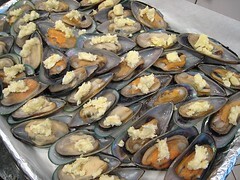 We should bottle that mussel juice and sell it! This didn't even make it until dinner. We just stood around the counter eating them from the sheet pan. Wonderful photos too. Im not a 'stop at a half-dozen' kinda guy, so the pile looks great. Who needs cheese? 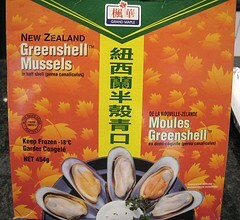 We finally have a source of greenshell mussels! 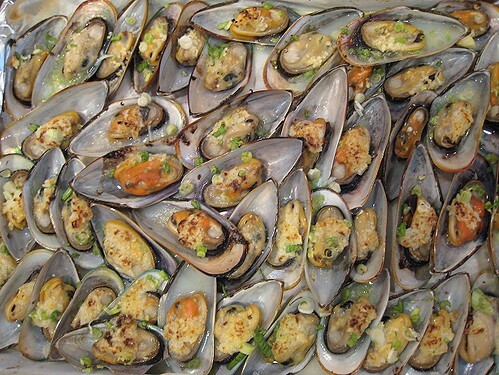 I would eat about a dozen of these mussels....great photo too! Wow... I'd stand around and eat them right when they came out of the oven too. I love these recipes! 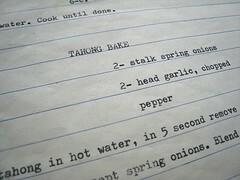 What I love the most is the typewriter-typed recipe. Is it weird that I kind of miss the idea of a typewriter? Those look DREAMY! I got here looking at the Chicken Tinola. I'll be coming back :)!